We will be making two useful little notebooks using traditional hand-binding techniques. The first will be a pamphlet stitch book, with a handmade paper cover, sewn with Irish linen thread. The second will be an accordion book with hard covers wrapped in handmade paper. You’ll leave with two books that you have crafted yourself. 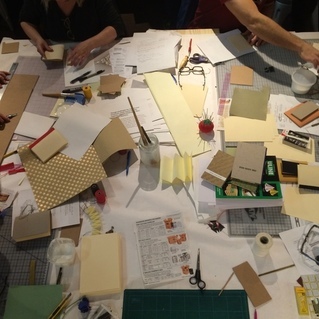 All tools and materials will be provided, including beautiful handmade papers to cover your books with. Come fold, glue, cut, and stitch with us! Then join Melanie afterwards for a trunk show of her jewelry line, Verso. Melanie Brauner is the owner and designer at Verso, a jewelry line combining sculptural hand papermaking with metal. In her studio, she also makes hand-bound books and archival boxes, marbled paper, and handmade paper lamps and sculpture. 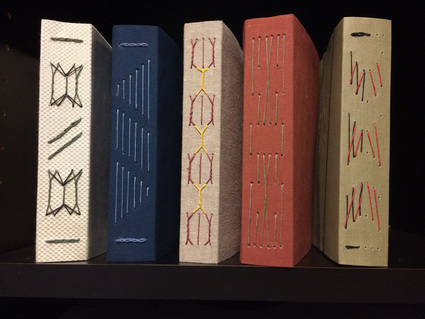 She was the owner and bookbinder at Trove Bindery, specializing in book and paper restoration and custom boxes, then closed its doors to attain a BFA in book arts and metalsmithing from Oregon College of Art and Craft in Portland, Oregon. Her studio is in Shoreline, Washington. Learn to make a Japanese-style portfolio to hold loose, unbound sheets of paper such as photographs, drawings or prints, thin books, or ephemera collections. You’ll make a cloth-covered case, lined with paper and fitted with three flaps to protect the edges of the contents, with a linen tie as a closure. These cases can be made in any size, with any arrangement of flaps or pockets inside. We’ll talk about all of the possibilities and variations on this versatile structure. Register on the Photographic Center Northwest's WEBSITE. Learn to make your own gift boxes and gift bags in this afternoon workshop. 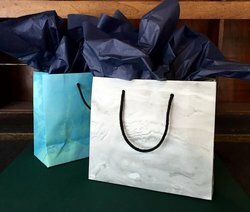 We'll start with folding and gluing techniques to make your own bags using decorative papers, and then make several versions of cut, scored, and folded box structures with lids. You'll leave with a full set of samples to use for gifts, and the ability to make a gift bag or box in any size you need. For students 12 years of age and up. This class will need at least four students to run. 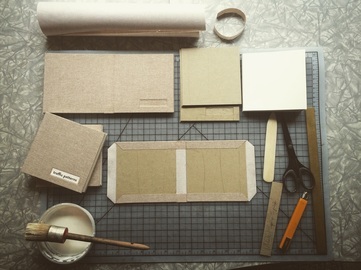 In this workshop, you'll learn all the skills that go into making a hardcover book. You'll sew a text-block by hand using a link stitch, prepare it to be bound, and make a bookcloth-covered case. You'll leave the class with a complete hardcover journal and the knowledge to make many more at home. No prior bookbinding experience required. Longstitch binding is perfect for creating photo albums and scrapbooks or flexible lay-flat journals. The pages are stitched into the book all the way through the spine, creating beautiful stitching patterns in any arrangement you can dream up. Stitching the pages through the spine means you can space them out as much as you like, to allow plenty of room for tipping in photographs or ephemera. We’ll learn to create the case, draft a stitching pattern, and use that pattern to sew the book together. At the end of the class, everyone will have a book that is unique to them. To register, visit the Photographic Center Northwest. For students 12 and up. Learn to create long stitch journals, a beautiful lay-flat binding with decorative stitching through the spine. Each student will leave with a journal stitched with a unique pattern that they designed themselves.